Alfred Thomas "Freddie" Highmore is a British actor, screenwriter, director. Freddie became world-famous as a child actor in the films Finding Neverland, Charlie and the Chocolate Factory, August Rush. Later, the actor became well-known for his work in the TV series Bates Motel. Freddie was born on February 14, 1992, in London. The boy's future was already decided. Father Edward Highmore is a famous English actor, and mother Sue Latimer is also a well-known talent agent. Sue's clients include famous Hollywood stars, such as Daniel Radcliffe. In 1995, their younger son, Albert, known as Bertie, was born. No wonder that Freddie Highmore started his acting career very early. At the age of seven, the boy was cast to participate in the favorite TV show Women Talking Dirty, where his brother also played. Soon the boy was already offered bit parts in various TV shows. Young Highmore was basking in the spotlight at the age of 12, after appearing in the film Finding Neverland, where he played Peter Davies. Freddie was a member of a star cast, and the boy was lucky to work on the set with Johnny Depp and Kate Winslet. This work brought the artist prestigious prizes, such as the Screen Actors Guild Award, as well as the Satellite and Empire Awards. It is noteworthy that the boy managed not only to film but also study well. He got the highest marks in three foreign languages, as well as in biology, chemistry, and mathematics. In 2004, Freddie also played in two more fairy tales Two Brothers and Five Children and It. Johnny Depp noticed the talented teenager, and in 2005 offered young Highmore the role of Charlie Bucket in the Christmas fairy tale Charlie and the Chocolate Factory. Depp played a title role in this movie. In 2006, the boy participated in a significant project. It was the romantic melodrama A Good Year, where he portrayed the title character of young Max. In the film, Russell Crowe played the role of the adult hero. In Luc Besson’s family adventure film Arthur and the Invisibles, the teenager was cast and participated in the voicing for the first time. Freddie voiced the protagonist, Arthur. His grandmother’s house can be stripped of her possessions to pay off the debt. The boy goes to a fairy-tale country, where grandfather's treasures are hidden. Arthur meets Princess Selenia (voiced by Madonna) along the way, as well as the Terrible Maltazard (voiced by David Bowie). In 2010, Freddie Highmore enrolled in Cambridge, where he studied Spanish and Arabic. The actor together with his family lives in Highgate, one of the most expensive areas of London. Freddie played with Albert and his father in some films, for example, the fairy tale Jack and the Beanstalk: The Real Story. Freddie Highmore’s acting career developed quite rapidly. In 2007, Freddie got a leading role in the romantic melodrama August Rush, where he played Evan, a boy from the orphanage. His parents, Lyla, and Louis (Keri Russell and Jonathan Rhys Meyers) do not know that his son is alive. But Evan begins to show excellent musical abilities which help him to reunite with the family. For his work in the film, Freddie Highmore won the Saturn Award and was nominated for an Oscar. Having played a bit part in the fairy tale The Golden Compass, Freddie Highmore got an opportunity to appear in the next fantasy film. In the movie The Spiderwick Chronicles, the young man played twins, who had different tempers. In 2009 Highmore portrayed Arthur in Luc Besson’s fantasy film Arthur and the Revenge of Maltazard. Penny Balfour, Mia Farrow, and Robert Stanton starred with him. One year later, the actor appeared in the continuation of the franchise Arthur 3: The War of the Two Worlds. At the same time, the actor participated in the voicing of the title characters of the animated films A Fox's Tale and Astro Boy. Later Freddie voiced the cartoon characters in Justin and the Knights of Valour and The Canterville Ghost. Freddie also voiced Pantalaimon in the hit movie which won the Golden Globe Award. The following year gave the British actor a starring role in Clarkson's biographical comedy-drama film Toast. Freddie played a young cook, Nigel, who strongly loved his mother. After the death of the mother, the father takes a housekeeper, and the boy suspects that she wants to replace his mother. Helena Bonham Carter played the role of the housekeeper. One year later, the actor’s filmography included a leading role in the melodrama The Art of Getting By, where Freddie's partner on the set was Emma Roberts. The film tells about the friendship and love of two unusual teenagers, George, and his girlfriend Sally. One of Highmore’s most famous works is the series Bates Motel, where Freddie played a hero named Norman Bates. Since 2013, the series has been already broadcast for four years and brought the actor a new surge of fame and glory. In the series, Freddie was not only a leading actor but also as a director and screenwriter. The film tells about killing by recklessness, and Norma Bates (Vera Farmiga), Norman's mother, is forced to hide it. The thriller has become a popular TV series on A&E, where it still has high ratings. There is no a lot of information about Freddie Highmore’s personal life because the actor does not have time for it. Freddie is busy with his studies and in demand in the movies. Freddie does not have pages on social networks, so the actor's photos can only be found on fan pages on Instagram. Freddie also studies French and plays the clarinet. Highmore is an avid soccer player. The young man adores video games, so he happily participated in the voicing of online games based on the films with his participation (Charlie and the Chocolate Factory, Arthur and the Invisibles, The Spiderwick Chronicles, Astro Boy). In 2016, the political drama The Journey premiered at the Toronto International Film Festival. Freddie Highmore got the role of Jack. The film was also screened at the 73rd Venice International Film Festival as a part of the competition program. Freddie portrayed Charlie Brenner in the comedy Almost Friends, released in 2016. The same year, the miniseries set Close to the Enemy with the participation of the actor started airing on television. The film tells about the period of World War II and the secret mission of British intelligence officer Callum Ferguson’s (Jim Sturgess), who should get German scientist, Dieter (Robert Glenister), to cooperate with the government. 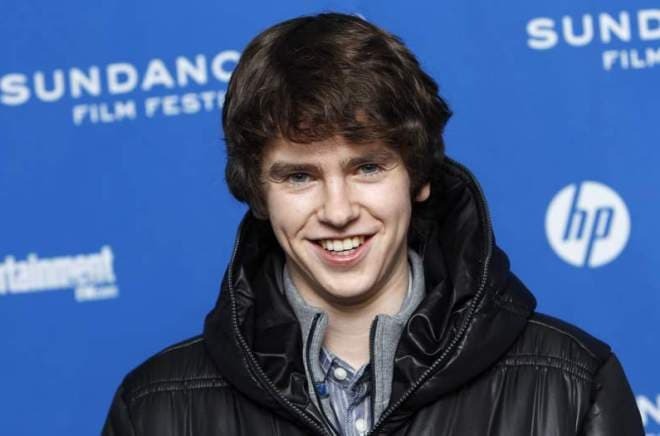 Freddie Highmore, whose height is 178 cm, played the role of the protagonist’s son, Victor. The actor played a leading role in the sports comedy Tour de Pharmacy, which premiered in the middle of 2017. The plot of the film was based on the history of the 1982 Tour de France when all participants were accused of doping. The film also featured Andy Samberg, Daveed Diggs, John Cena, and Orlando Bloom. Now the medical series The Good Doctor is at the post-production stage. It will premiere on ABC on September 25, 2017. 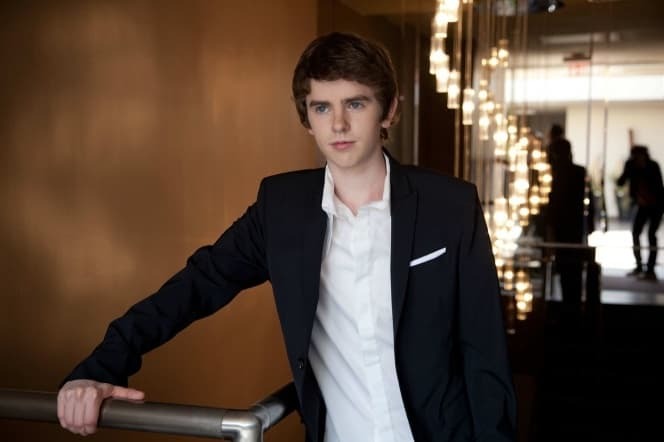 Freddie Highmore will perform the leading role of autistic savant surgeon Shaun Murphy. Richard Schiff will play Dr. Glassman, the mentor of the young doctor.